Another year has gone by and we need to reflect on what we have learned so we can make adjustments to our strategic plans for 2012. I recently did an industry briefing for the Periodical Publishing Policy and Programs team at Canadian Heritage in Ottawa, and here is an excerpt of what I said that I can share in my blog. I identified five key market trends that will affect magazine publishers in 2012 in the fast changing publishing landscape. I will also be giving away a Kindle Fire this year every three months and you can enter to win one at the link below or at one of the conferences I will be sponsoring this year across Canada. Social media has increased the power of the consumer – markets are now conversations as consumers can post product experiences and share with their friends. Social media enables companies to have a one-on-one relationship with their customers bypassing traditional advertising channels. This is a scary proposition as you do not need to advertise to talk with your customers. I have a friend at RBC, Gord Kerr, who is now the director of corporate social media so the change is happening with large advertisers. Advertisers have added to the traditional media mix (TV, radio, print) with websites (desktop and mobile), YouTube channels, emails and Facebook pages. In the latest report from FIPP (Federation of International Periodical Publishers) the North American magazine ad market is shrinking. At the end of the day ad agencies follow the rule of Right Message, Right Time, Right Place, but today right place means not just in-home or in-car, it also can be at the hockey rink, on the bus or at the airport on their tablet or smartphone. Today’s environment requires a multi-platform distribution model – print, eReaders, smartphones, tablets, computers, game consoles and televisions. The hardware manufacturers have the most market power in this equation, but content is still king in my books. 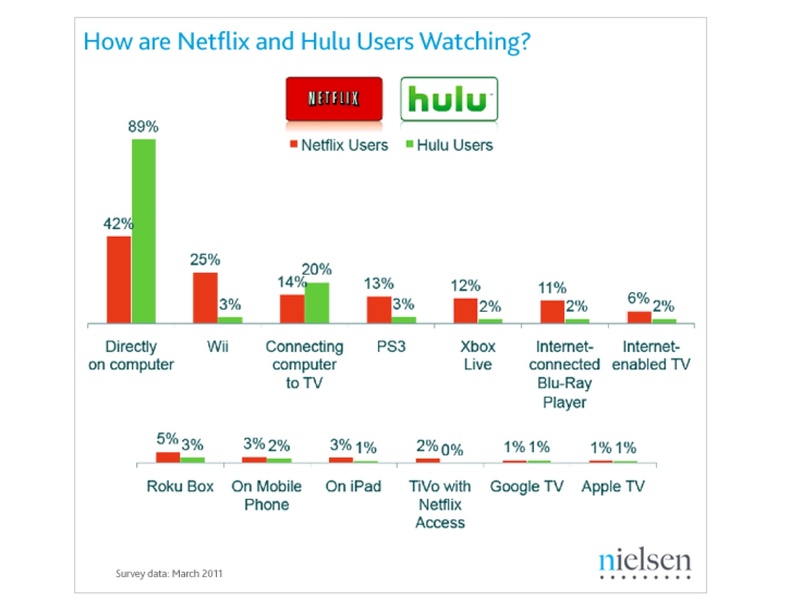 We have to adapt in the way people are consuming media, just have a look below how people are consuming movies and TV on Netflix and Hulu for example. While we worry about tablets and smartphones, game consoles are becoming just as important as the chart below illustrates. You can say 2011 was the year of the tablet PC app, and digital superstores for content are emerging – Apple, Android, Amazon, Kobo, Sony and Netflix are becoming dominant players. I forecast that first generation digital magazine newsstands are going to be overpowered by these new stores – such as Zinio and Magazines.com. We are going to see the Walmart effect as these superstores are making it harder for niche players to make money. According to Giorgina Bigioni, publisher of The Kit, Canadian publishers need to adapt faster in this changing marketplace or larger USA titles are going to dominate shelf presence in these new digital superstores. She fears that history may repeat itself on the digital newsstand as USA titles currently dominate the brick and mortar model. The Kit was featured in the new Apple magazine Newsstand that was launched in the fall of 2011, so we know Canadian publishers have world class content. Aggregators (Flipboard, AOL, Google) are using content without paying the creator, but still generate ad revenue from this content. Piracy of content is hard to enforce, but can be done, remember the Mygazines (who used the Napster model when the company was launched) newsstand problem a few years back. Publishers together effectively sued them into submission for putting their content up for free. This blog for example has been lifted many times from unscrupulous website operators. Just Google the title of my Sony blog to see how it has been hijacked. My wish for 2012 is that these aggregators should pay into a content fund so journalists can get some payment in return for their great content that they are now getting for free. This issue is going to be discussed at the upcoming Canadian Association of Journalists national conference this April in Toronto, where I will be moderating a session on the state of the magazine industry.